Mission scientists are studying New Horizons data to discover what’s pumping up the nitrogen in Pluto’s atmosphere, even as it escapes into interplanetary space. 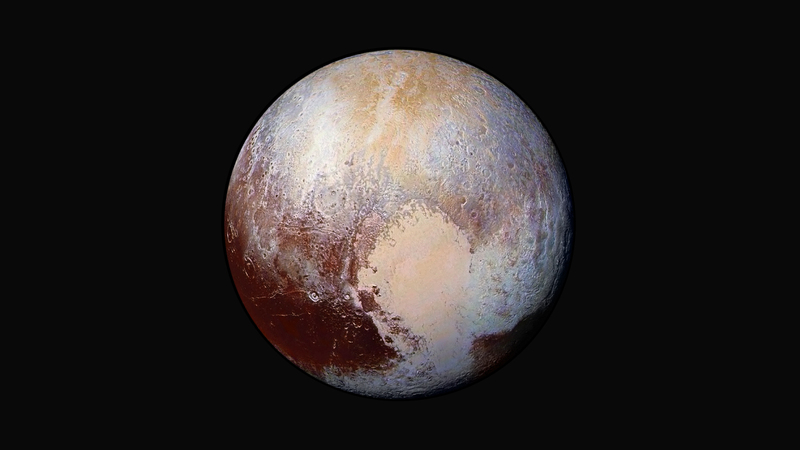 This enhanced color image – created from four images from New Horizons’ Long Range Reconnaissance Imager (LORRI) combined with color data from the spacecraft’s Ralph instrument – helps scientists detect differences in the composition and texture of Pluto’s surface. The data hint that Pluto may still be geologically active, a theory that could explain how Pluto’s escaping atmosphere remains flush with nitrogen. So where does all this nitrogen come from? Kelsi Singer, a postdoctoral researcher at Southwest Research Institute, and her mentor Alan Stern, New Horizons principal investigator and SwRI associate vice president, outlined likely sources in a paper titled, “On the Provenance of Pluto’s Nitrogen.” The Astrophysical Journal Letters accepted the paper for publication on July 15, just a day after the spacecraft’s closest encounter with the icy dwarf planet. “More nitrogen has to come from somewhere to resupply both the nitrogen ice that is moving around Pluto’s surface in seasonal cycles, and the nitrogen that is escaping off the top of the atmosphere as the result of heating by ultraviolet light from the Sun,” said Singer. Singer and Stern looked at a number of different ways that nitrogen might be resupplied. They wondered if comets could deliver enough nitrogen to Pluto’s surface to resupply what is escaping its atmosphere. They also looked at whether craters made by the comets hitting the surface could excavate enough nitrogen – but that would require a very deep layer of nitrogen ice at the surface, which is not proven. The team also studied whether craters could expose more surface area, by punching through surface deposits that would likely be built up over time. And while the data weren’t in before this paper was written, the newest images of Pluto show land forms that suggest heat is rising beneath the surface, with troughs of dark matter either collecting, or bubbling up, between flat segments of crust, which could be related. New Horizons is part of NASA’s New Frontiers Program, managed by the agency’s Marshall Space Flight Center in Huntsville, Ala. The Johns Hopkins University Applied Physics Laboratory in Laurel, Md., designed, built, and operates the New Horizons spacecraft and manages the mission for NASA’s Science Mission Directorate. SwRI leads the science mission, payload operations, and encounter science planning.